Welcome to February’s issue of the R.E blog! It will be a busy month with the Lenten season beginning on the 14th but there will be the welcome break for mid-term from Monday 12th to the 19th! This month’s blog continues with a calendar of events for February with a selection of resources linked to important dates from international justice, peace and environmental calendars as well as important dates/feast days from religious calendars. There is also a variety of further resources on this website http://education.dublindiocese.ie/post-primary/ under classroom and general resources. We will also continue to add resources as Gaeilge with the assistance of Sr. Mairéad Ni Bhuachalla. St Brigid's Holy Well is located the Clondalkin area. So, on the day, with the help of some of the students from Colaiste Bride there will be a short pilgrimage to the Well from the front cark park of Clondalkin Village Church after the 10am Mass. Fr. Damian will host a short prayer service with a blessing of the water from the Holy Well. Everyone is welcome to join with them! If you cannot join them, the parish have made a few resources for St Brigid's day as well as the prayer leaflet and a little bit of history about the Well in Clondalkin that can be viewed or downloaded from their website- http://www.clondalkinparish.com/?p=2625​ From Frank Brown Parish Pastoral Worker. The Combined Catholic Parishes of Clondalkin. Déanfar Aifreann na Féile Bríde a cheiliúradh in Áras Chonnradh na Gaeilge, Corrán Grattan, Inse Chóir, Baile Átha Cliath 8, Déardaoin 1ú Feabhra @ 8.15 i.n. Ceiliúraí an tAthair Brian de Búrca O.M.I. Beidh oíche caidrimh ina dhiaidh. Beidh fáilte roimh chách. Lá Fhéile Bhride faoi mhaise agat! Happy St. Brigid’s Day. Today the Church celebrates the feast of the Presentation of the Lord, which occurs forty days after the birth of Jesus and is also known as Candlemas day, where the blessing and procession of candles is included in today's liturgies. trí Chríost ár dTiarna. Amen. Human trafficking is the modern-day term for slavery. Women, children and men are bought and sold, beaten, abused and sometimes killed as they are traded like commodities on the invisible trafficking markets across the world. On 8th February, Caritas invites you to participate in the International Day of Prayer and Awareness against Human Trafficking, which is promoted by the Union of Superiors General. The day marks the feast of Saint Josephine Bakhita, a Sudanese woman who was sold into slavery, abused but later freed. Today is World Day of the Sick, an observation started by Pope John Paul II as a way for believers to offer prayers for those suffering from illnesses. The theme for this 26th world day of the sick is provided by the words that Jesus spoke from the Cross to Mary, his Mother, and to John: “Woman, behold your son … Behold your mother. And from that hour the disciple took her into his home” (Jn 19:26-27). 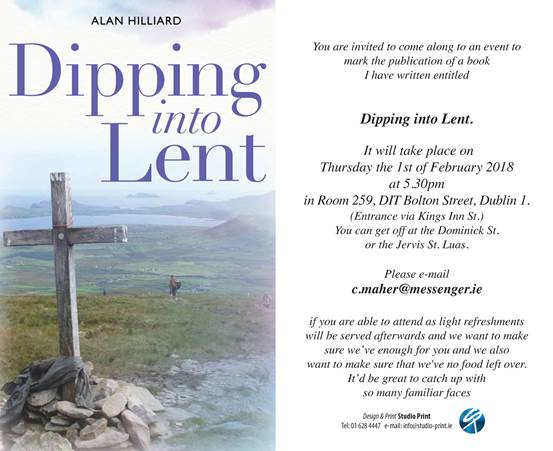 A number of events will take place in the Diocese to mark this day. Dublin Diocesan World Day of the Sick Conference takes place on Saturday 10th February 2018 from 9.30am to 2.00pm in St Agnes’ Parish Centre, Crumlin, Dublin 12. Mass of Healing and Anointing of the Sick will take place on Sunday the 11th of February at 3p.m in St Agnes’ Parish Church, Crumlin, Dublin 12. Main Celebrant: Archbishop Diarmuid Martin. Inniu Céadaoin an Luaithrigh, an chéad lá den Charghas, tréimhse 40 lá ullmhúcháin don Cháisc, an fhéile is tábhachtaí i bhféilire na hEaglaise. Cloisimid faoi dhaoine a dhéanann díthocsainiú chun a gcorp a ghlanadh amach, agus déanann daoine mór-ghlanadh nuair a bhíonn athchóiriú á dhéanamh acu ar sheomra nó ar theach. Tugann an Carghas deis dúinn díthocsainiú spioradálta a dhéanamh agus ár gcroí a athnuachan. Is siombail den díthocsainiú spioradálta an luaithreach seo agus cuirtear ar an gclár éadain é mar chomhartha aithrí i.e. go bhfuil beartaithe ag duine droch-nósanna a thréigean agus dea-ghníomhartha a chleachtadh. Other Important Dates/Information to Note! 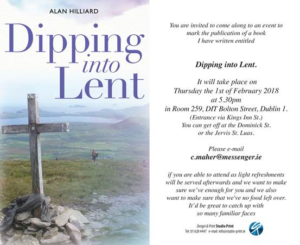 Dublin 9, Monday 19 February at 8.00 p.m. or webcam www.rednuns.com Music led by the Dublin Diocesan Music Group. The theme for each World Meeting of Families is chosen by the Pope. In choosing The Gospel of the Family: Joy for the World, as the theme for the ninth World Meeting of Families in Dublin, Ireland, Pope Francis invites us to reflect on a theme that was central to the Synodal process that led to his post-Synodal Apostolic Exhortation Amoris Laetitia: On Love in the Family. World Meeting of Families 2018 continues with their preparations and encourage involvement at every level. Thousands of people will be travelling from very distant places to participate in World Meeting of Families 2018 (Dublin, 21-26 August 2018). Many would be unable to come if they also had to cover the cost of accommodation. 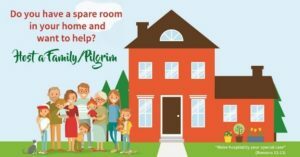 Do you have a spare room? Would you be willing to host a person, a couple or a family next August? Help us welcome visiting families to Ireland and have a home-from-home experience. Re:link is a 4-page supplement, which appears in The Sacred Heart Messenger magazine every month. Re:link is linked with the Religious Education curriculum and is produced and edited by a secondary school religion teacher. Re:link is not designed to replace textbooks, but it can be used as an additional resource for students, teachers and parents. What makes Re:link different from other publications is that it offers up-to-date information and examples in the way that textbooks cannot. Re:link produces information in a way that students can relate to, whether it be celebrity profiles, interviews with students their own age or through competitions.